generateMesh(model) creates a mesh and stores it in the model object. model must contain geometry. To include 2-D geometry in a model, use geometryFromEdges. To include 3-D geometry, use importGeometry or geometryFromMesh. generateMesh can return slightly different meshes in different releases. For example, the number of elements in the mesh can change. Avoid writing code that relies on explicitly specified node and element IDs. generateMesh(model,Name,Value) modifies the mesh creation according to the Name,Value arguments. mesh = generateMesh(___) also returns the mesh to the MATLAB® workspace, using any of the previous syntaxes. Generate the default 2-D mesh for the L-shaped geometry. Create a mesh that is finer than the default. Create a PDE model and include the BracketTwoHoles geometry. Generate a default mesh for comparison. Create a mesh with target maximum element size 5 instead of the default 7.3485. Element type, specified as the comma-separated pair consisting of 'GeometricOrder' and 'linear' or 'quadratic'. In general, 'quadratic' elements produce more accurate solutions. Override the default 'quadratic' only to save memory or to solve a 2-D problem using a legacy solver. 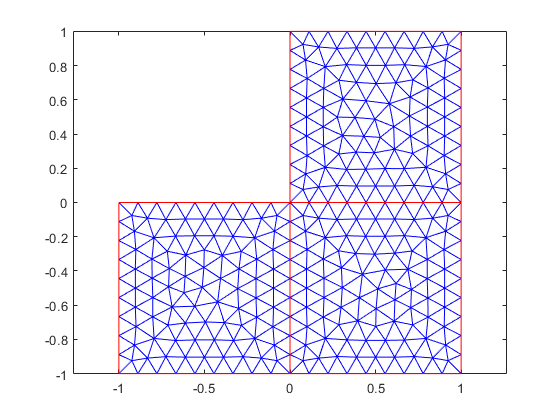 Legacy PDE solvers use linear triangular mesh for 2-D geometries. Mesh growth rate, specified as the comma-separated pair consisting of Hgrad and a number greater than or equal to 1 and less than or equal to 2. 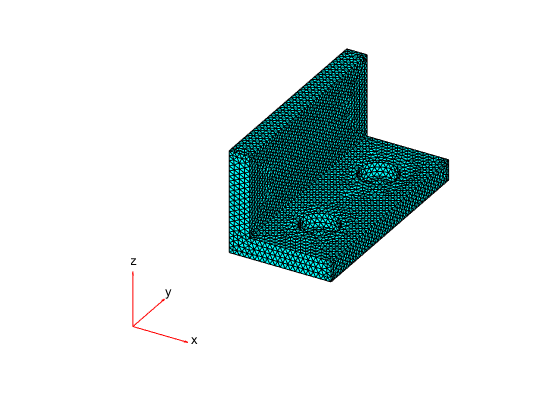 Target maximum mesh edge length, specified as the comma-separated pair consisting of Hmax and a positive real number. Hmax is an approximate upper bound on the mesh edge lengths. Occasionally, generateMesh can create a mesh with some elements that exceed Hmax. generateMesh estimates the default value of Hmax from overall dimensions of the geometry. Small Hmax values let you create finer meshes, but mesh generation can take a very long time in this case. You can interrupt mesh generation by using Ctrl+C. Note that generateMesh can take additional time to respond to the interrupt. Target minimum mesh edge length, specified as the comma-separated pair consisting of Hmin and a nonnegative real number. Hmin is an approximate lower bound on the mesh edge lengths. Occasionally, generateMesh can create a mesh with some elements that are smaller than Hmin. generateMesh estimates the default value of Hmin from overall dimensions of the geometry. Mesh description, returned as an FEMesh Properties object. mesh is the same as model.Mesh.